SEOUL, Nov. 6 (Yonhap) — Korean Air Lines Co., South Korea’s national flag carrier, said Tuesday it will transfer most of its data and applications to Amazon’s cloud computing platform to overhaul its entire IT infrastructure in the next three years. The planned data migration to Amazon Web Services (AWS) is part of Korean Air’s broader plan to invest 200 billion won (US$178 million) in the next 10 years to accelerate the company’s digital innovation and transformation, Korean Air said in a statement. On Tuesday in Seoul, Cho, AWS Asia-Pacific Managing Director Ed Lenta and LG CNS Chief Executive Kim Young-seob signed a data center outsourcing agreement. 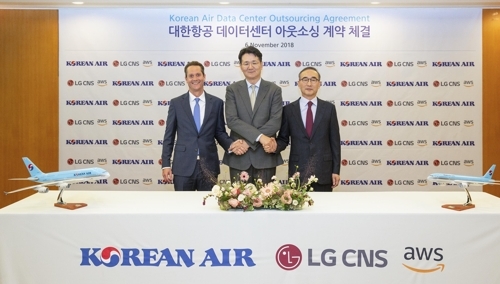 LG CNS, one of Korea’s leading IT outsourcing providers, will help Korean Air move its data to the AWS system, a company spokeswoman said by phone. The data to be transferred to an AWS cloud platform include Korean Air’s entire set of websites, cargo management system, flight control system and enterprise resource planning, which are currently operating through the firm’s data center in Seoul, it said. Korean Air is the first of the country’s conglomerates and global airlines to migrate to AWS. Amazon is the world’s biggest cloud operator through AWS, which controls around 45 percent of the world’s cloud computing capacity.